The Rexel Mercury RDSM750 Super Micro-Cut Shredder shreds paper into very small particles measuring just 0.8x11mm in size. 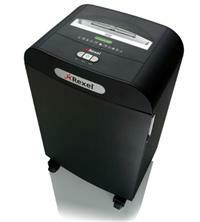 This gives it a very high P-6 security rating, suitable for the shredding of highly secret and confidential documents. For an idea of the size of cut, an A4 sheet is shredded into approximately 6000 pieces. Perfect for shared offices of up to 20 users, the RDSM750 can handle up to 8 sheets of 70gsm paper at a time (or 7 sheets of 80gsm). The large 50 litre bin is capable of holding approximately 550 sheets of shredded paper before it needs to be emptied and the shredder supports the use of recyclable bags in a pull-out frame which makes it easy to empty. Other features include: Jam-free technology; auto shut down after 2 minutes of non-use; super quiet operation due to an induction motor; easy to use controls; and a 250mm paper entry width. So, if you need an office shredder with a very high level of security for your ultra-sensitive document shredding, then consider the Rexel Mercury RDSM750 Super Micro-Cut Shredder.